Download the Windows 10—Fall Creators Update SDK today. Want to learn more about what’s in it? Get the overview by watching the Windows Developer Day keynote and dive deeper with over 18 sessions on Windows 10 features and capabilities here. And don’t forget to enter an epic sweepstakes with amazing prizes. When you submit or update a Windows Store app targeting Windows 10—Fall Creators Update (build 16299), you’ll have a chance to win one of five prize packages—each valued at over $8,000 USD. * You’ll receive one entry for each app or game you create or update that meets the criteria. *No Purchase Necessary. Open only to Universal Windows Apps developers 18+. Sweepstakes ends November 17, 2017. For details, see Official Rules. USB C, 17 hour video playback on battery, both a 13.5 and 15 inch version, lots of memory, lots of CPU, lots of storage. Watch this video that will walk you through the design and reasons for the design by Jeff Stewart, Senior Director and Product Line Manager at Microsoft. We like the word “FREE” don’t we. Microsoft has extended the Windows 10 S to 10 Pro upgrade offer until March 31, 2018. Microsoft originally intended to end this offer in December but we welcome the extension they are now offering. Windows 10 S is being positioned for the education market as a more secure version of Windows 10 because it only allows apps from the Windows Store to be installed. It also happens to come as the default operating system on the Surface Laptop. If find you need to install an app that is only available outside of the Windows Store, the ability to upgrade to Windows 10 Pro at any time is handy to have, particularly through the free promotion. Once the promotion ends in March, however, Microsoft is expected to charge upwards of $49 to upgrade. Education customers can switch devices to Windows 10 Pro Education using the Microsoft Store for Education. For more information, see Switch to Windows 10 Pro Education from Windows 10 Pro or Windows 10 S.
If you try Windows 10 S and decide to switch back to the previously installed edition within 10 days, you can go back to the previously installed edition using the Windows Recovery option in Settings. For more info, see Go back to your previous edition of Windows 10. It has been a pet peeve of mine that Microsoft had held back regular channel partners from selling their Surface Series Products. We are now authorized so if you are in the market let us know so that we can get you over some pricing information. Surface Laptop in Graphite Gold, Burgundy & Cobalt Blue are (finally!) coming to distribution. Surface Laptop Colors are launching in distribution on November 1, 2017. Its great that they added the thunderbolt USB3c connectors to it. Pretty impressed with the updates. Lenovo ThinkPad X1: It’s not a laptop. It’s a ThinkPad. I love these ad videos. Microsoft has been warning users about tech support scams for years, and this week shared how it is seeing these scams continue to evolve by targeting victims through emailed links that lead to tech support scam websites. A survey last year, cited by Microsoft, found that two out of three people have experienced a tech support scam in the previous 12 months. Microsoft has been tracking tech support scams for years, working with law enforcement to investigate tech support fraud networks and strengthening its technology to prevent tech support scams from making it in customer inboxes in the first place. Microsoft recommends that users update to Windows 10 if they haven’t already to ensure they are benefiting from the most up to date security defenses. The August update version number is 17.841.5771 to have all of these new features. I just signed up for the trial version last night and was suitably impressed at the connection speed and resolution of the image stream. This service is just $35/month and provides basic cable channels for you with unlimited DVR functions. If you are only interested in local sports and news this is a great alternative to other TV options. I’m currently looking at a $250+ bill each month for my current Comcast account. If you are thinking about cutting the cord then let’s look at the math. If you decide that this is something you want to consider, you will probably want to purchase a couple of ChromeCasts for your TV’s around the house. This gives you the ability to access YouTube TV right from there without a problem. Create a family group to share YouTube TV—as well as other Google apps and services—with up to 5 other people. If you've purchased a YouTube TV membership, you can create a family group to share your membership with up to 5 people at no additional cost. When you create a family group, you become the family manager. As the family manager, you can invite family members (ages 13+) to join your family group. As a family group member, you can build your own personal library of content in YouTube TV. Your viewing preferences and DVR are all your own—we won't share your library or watch history with your family group. You can use YouTube TV on up to three separate devices at the same time. For example, if you're watching YouTube TV on both a computer and a mobile device, this counts as two of the three available devices—even though they’re being used by the same account. This looks very tempting to me except that two of the channels my wife watches PBS and Hallmark, are not included and for local sports we are missing Root for the Penguin Hockey games and Pittsburgh Pirates. I have another eight months on my current Xfinity Contract so hopefully we will see some other changes over the next couple of months. This is a pretty neat device that one of our vendors just sent us information on. Priced at $49.95 it allows you to convert your laptop/notebook mini-display port for use with HDMI, DVI-I or HD-15 VGA. Marketing Information: Send a video signal from a tablet, laptop computer, or another source device with a Mini DisplayPort output port to a projector, monitor, or HDTV with an HDMI, DVI or VGA input port. This compact all-in-one converter is an ideal solution for use in schools, conference rooms, or other work spaces that may utilize assorted displays with varying inputs in multiple rooms throughout a building. On The Go Enhanced - Be prepared for any meeting, presentation, or event with the full confidence that you have the right connections in an ultra-compact design. The Mini DisplayPort to HDMI, VGA, or DVI adapter allows you to connect a Mini DisplayPort-equipped laptop or tablet to a projector, monitor, or HDTV with an HDMI, VGA, or DVI input port. The compact design of this adapter converter makes it a perfect fit for BYOD (Bring Your Own Device) applications in education or corporate environments. Straightforward Install - This simple plug and play adapter converter does not require drivers for install and the device is powered through Mini DisplayPort bus power, so no additional power adapters are needed. Port Protection - The dongle-style adapter converter reduces strain on the video port. The cable between the Mini DisplayPort connection and the adapter converter provides strain relief that protects the port from strain damage as cords are moved. Note: This adapter converter will output signal to one video port at a time. This adapter converter is not designed to output multiple video signals simultaneously. 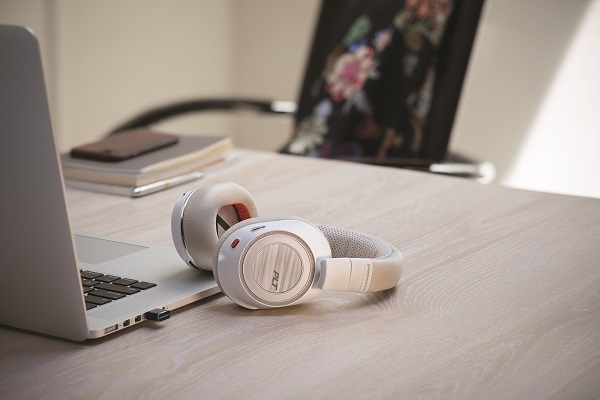 The latest release of Plantronics Manager Pro has been successfully deployed globally. Existing customers now have access to all the new features and benefits. Additional products supported for the Acoustic and Conversation Analysis suites: now including Unified Communication products (Voyager 3200 UC and Voyager 8200 UC ). UC customers can now benefit from obtaining greater insights and improve the quality of conversations, that Contact Centre customers have already been enjoying. New Bluetooth Link Quality report within the Conversation Analysis suite: Helps to identify audio issues caused by the Bluetooth radio link between the headset and the computer, allowing troubleshooting right to the supported end point. Use the Plantronics Manager Pro v3.10 Software Release to upgrade existing customer entitlements to secure future sales and recurring revenue and to acquire new customers. And don’t forget: With the newly added UC product support for the conversation and acoustic analysis suites this release offers also a hardware upsell opportunity. The new Open Data Access APIs now provides partners with a development opportunity by accessing the data from Plantronics Manager Pro and integrating into existing or new applications. Allowing partners to solve customer problems with tailored solutions that can now include the data and insights provided by Plantronics Manager Pro. To view the release notes and learn more about what’s new see here. 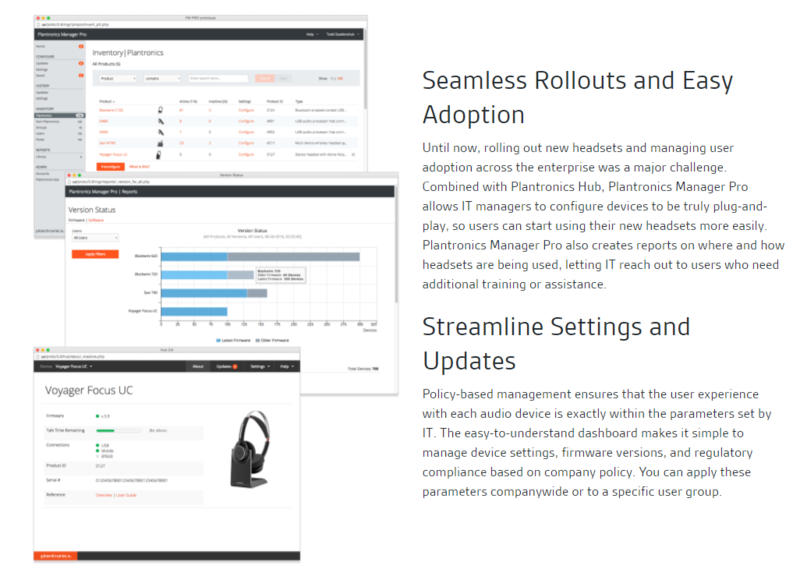 To learn more about Plantronics Manager Pro and what it can offer see here. With the new Voyager 8200 UC Bluetooth® headset we add a new product to your existing portfolio which is designed for voice clarity and for a growing addressable market. The new Voyager 8200 UC Bluetooth® is the first boomless Bluetooth stereo headset from Plantronics featuring business grade audio for communications, passive and dual-mode active noise canceling (ANC) technology for blocking out background noise, and high-quality hi-fi stereo sound for an immersive experience to focus and concentrate when listening to music. Interesting Article describing how Fake News is being distributed to make it look like the Real Thing! Makes sense that you would want the widest distribution that you can achieve. This report discusses an Indiana University research report that confirms it. And now comes a team of researchers from Indiana University who say they have the data to confirm it. In a paper titled “The Spread of Fake News by Social Bots,” they reported that an analysis of 14m social media messages regarding 400,000 claims on Twitter during and following the 2016 US presidential campaign and election provided, “evidence that social bots play a key role in the spread of fake news. Accounts that actively spread misinformation are significantly more likely to be bots”. Should I Subscribe to O365 for myself? If you are considering using Microsoft Office Suite at home you have several options that you can consider. The first is whether you want to pay on a subscription basis or if you want to move into a one-time purchase model. In the subscription model you have two choices between Office 365 Personal or Office 365 Home. Why I like the subscription model. First, I can always be up to date. If you only have one machine but a couple of mobile devices, tablet or phone, then you are licensed to put these most of the suite products on these as well. You also have access to on-line versions of Word, Excel, PowerPoint and OneNote so that you can be on any computer and access your programs. You get 1 TB of cloud space, so you can also store you documents to the CLOUD and have access to these files from any device. Last, you get the full Office Suite. Word, Excel, PowerPoint, OneNote, Publisher, Access and Outlook. Office 365 Home offers installing the office suite for up to five users with each user getting their own 1TB cloud storage space for a cost of $99.99/year. Office 365 Personal is $69.99/year. Now let’s do the math. If you think you would be upgrading your Office license with each new release you Perpetual licenses would be slightly less expensive then your subscription counterparts. However, you are not getting the ability to install on mobile devices, in the case of Office 365 Home you can install on up to 5 workstations (all the kids, you and your wife’s systems, and you don’t have the cloud apps or storage space. If you need it on more than 1 machine than the Office 365 Home subscription seems to me to be a no brainer. Of course if your employer has opted into Office 365 Business Premium, then that creates a whole different scenario. It is important to not only have multiple copies of your digital photos but if you are using Lightroom to manage and edit your picture collection you should backup this database catalog as well. The catalog holds all of your edits and organization of your pictures. Don’t be caught with your catalog becoming corrupt and not having a backup to fall back on. I take the few minutes every time I close a Lightroom session to backup my current updates. Having a corrupt catalog is pretty rare but it happens. This simple procedure will keep you from wanting to slit your wrists if corruption error shows its ugly face. There is a button that you can hit called Repair Catalog if this occurs but it doesn’t always work. So, don’t take the chance and backup. If you don’t have a backup, you’ve lost all your edits. All your organization. All your star ratings, pick flags, photo books you created, collections — everything — you are starting over from scratch with Lightroom. I don’t want that to happen to you, and the fix is easy — all you have to do is not totally ignore the dialog below that appears when you quit Lightroom. NOTE: These backups will be saved into a folder named “Backups” and that folder will be in the same folder where your current Lightroom catalog lives on your computer. This was a tip from Scott Kelby, lightroomkillertips.com that I thought was important enough to reiterate. Researchers from SophosLabs and elsewhere have found three cases of SonicSpy-infused apps in Google Play: Soniac, Hulk Messenger, and Troy Chat – messaging apps that hide their spying functionality and await orders from command-and-control servers. Google booted the apps from its store after they were discovered. Researcher Chen Yu said the Google Play versions had “tiny installation numbers and existed for a very short time”. Though three were found on Google Play, SophosLabs has counted 3,240 SonicSpy apps in the wild. Some reports place the number at 4,000. According to multiple reports, a single bad actor – probably based in Iraq – has released these apps into the wild since February. This is a May 3, 2017 article written by David Branscome of Microsoft. I have always felt that it is important to take a deep look at the tools that you think that you want to use to fully take advantage of they offer and can do for you. If you are willing to make the monetary investment in it, shouldn’t you also make the investment of your time to get all that you can from the dollar investment. This article is a great way of taking a closer look at the components of Teams and how it works. I like it because it allows you to create a working SharePoint site with great interactivity for your organization’s use. Who can access Teams? It is all about licensing through Office 365. See the chart below. Make sure to read all the planning documentation on the www.successwithteams.com website.